5. How does WaykiChain work? 7. What is WICC? How to Buy WICC? 8. What is the use of WICC? 9. What are WaykiChain’s advantages as a public chain 3.0? Born in Jan. 2017, Waykichain is a 3rd generation public chain with DPoS consensus mechanism. The transaction speed can keep above 1000 TPS in actual use. WaykiBet1.0, build on WaykiChain and launched in May 13, 2018 is the first ever prediction DApp based on public chain with over 130,000 downloads. The DApp has now been updated to V2.5.WaykiChain as a team focuses on blockchain technology development and community related operations. We are committed to building a decentralized, community self-governance big platform and big ecosystem, and we are moving toward it with nearly 1 million community members. The future of WaykiChain is a big community-driven public chain ecosystem. WaykiChain aims to build a decentralized application platform that can provide users with complete blockchain-powered smart contract system. Anyone can realize their business ideas on WaykiChain and develop their own DApp, and build their own brands. WaykiChain takes decentralized prediction, assets trading and forex trading as entry points to expand markets in the early stage. After accumulating plenty of application users and developers, WaykiChain will gradually perfect its upper blockchain applications. Currently, WaykiChain tech team is focusing on underlying public chain development. WaykiChain will provide friendly development environment to developers with sufficient development templates an interfaces. Besides, WaykiChain team plans to take a part of WICC as reward those developers who have made important contributions to the community. WaykiChain is committed to building an underlying technology platform that truly integrates blockchain application and real business. Along with its development, WaykiChain will gradually grow into a big ecosystem with totally decentralized operations, and brings the convenience of blockchain to every user. WaykiChain is a public blockchain with high concurrent processing capability and generates a new block at a fixed interval of 10 seconds. Through rigorous engineering tests, the average transaction throughput is verified as 1000+ TPS for coin transfer transactions and 100+ TPS for smart contract based transactions. WaykiChain adopts Delegated Proof of Stake (DPoS) as the blockchain consensus mechanism since it is most energy efficient, offering high transaction throughput while maintaining a certain level of community driven decentralization. There are in total 11 ledger nodes (i.e. block producers), responsible for validating and packing all network submitted transactions into blocks. During block creation, a ledger node collects reward tokens that are carried within each transaction. The 11 ledeger nodes take turns in block creation by the time interval of 10 seconds and the sequence of whom to do block creation at a specific time slot is randomized to avoid prediction by external observers. The overall network could experience infrequent hard forks due to network or ledger node performance instability. However, the robust consensus algorithm allows a quick recovery from one or several hard forks by resorting to a unified single longest fork and the network will thence stabilize and perform steadily again. The 11 ledger nodes are elected through a never-ending voting process. Individual coin holders can cast their votes to the candidate ledger nodes. Each vote can be cast for up to 11 candidate ledger nodes. By so doing, the amout of WICC coins which is equal to the the amount of votes will be locked into the network, similar to bank saving activities. By the next voting events (i.e. increase or decrease the votes, vote for new candiates) a certain amount of interest coins will be newly generated and released to the person who previously cast votes to the candidates. The interest rate plan goes as follows: the first year’s interest rate is 5%, it will decrease by 1% annually in following years. Once it reaches 1% as the interest rate, it will stablize as 1% for all the subsequent years. The top 11 candidates who recieved the top most votes cast by community coin holders automatically becomes the ledger nodes and take turns with certain randomness by a random perturbation algorithm to do the block creation by validing and packing the transactions into a new block. WaykiChain core technology team is committed to providing the develop-friendly interfaces of each layer and improving the technical documentation to help the community better build the ecosystem. WaykiChain’s smart contracts are written in Lua scripts and processed within Lua Virtual Machine engine. Lua’s various libraries are built in for developers to leverage. Due to the openess and compleness of Lua script and its liabrary provided in WaykiChain software, developers can build many forms of appliations that meet the requirements of Turing-complete computing scenarios. Lua scripting is relatively simple and requires no pre-compilation, and is thus also easier to deploy compared to other smart contract implmentation. WaykiChain uses a DPoS consensus mechanism with eleven accounting nodes. The annual rate of return is 5% for the first year, with a 1% increase with every year that goes by. Each time a block is created, an accounting node is randomly associated. The accounting node gains all of the transaction fees in its accounting block. Users can earn interest by locking WaykiChain coins. The interest is automatically determined each time the votes for the corresponding user account change. The terms of betting are triggered by the initiator through smart contract transactions. Users can initiate various betting contract transactions, all of which can be searched and identified in the block browsers. When the betting is over, the bet initiation will publish the final results and the gaining will be then shared accordingly. In short, the betting revenue is automatically issued to the user’s wallet after the betting results are displayed. The smart contract provided by the platform makes it possible for asset initiations to create dividend sharing rules. These rules are only triggered by various conditions. Hence, the final price of the assets in circulation will be determined by the market’s behavior towards the object in the transaction. Waykichain Token, WICC is a token only used and circulated in WaykiChain Wallet on our DApps. WICC itself does not have any FIAT characteristics. By consuming WICC as a kind of fuel, users can use applications on WaykiChain; by locking their WICC for a certain period of time, users can share the revenue from WICC Lock Revenue Sharing Plan; and by voting for effective and stable accounting nodes, users can earn related interest. WICC can be obtained by participating in the lock plan, by accounting, voting, and subscription, or by trading with other holders. This means WICC will be listed on lots of exchanges and traded with other cryptocurrencies, thus WICC also has trade value. BACKGROUND- The first smart contract based application delivered by WaykiChain’s team is the WaykiChain decentralized betting application. In this application, the smart contract will assign a time duration in which the user can engage in the betting process. All the conditions related to betting will be given. When a bet is finished, the contract will release the results. The smart contract will then reward the winners. This DApp was launched in May 2018, attracting over 130,000 users to download and bet and has been upgraded to V2.1 ever since. The latest product WaykiBet DApp V2.5 is planned to launch in November along with a new WaykiChain wallet. INTRODUCTION- WaykiBet is a DApp developed on WaykiChain that allows strangers to build betting transactions without a trust base. WaykiBet has lowered the barriers for users by using smart contracts to deliver payout automatically, and recording transactions on blockchain with zero handling fee, providing users the best and fairest betting experience. More flexible: With smart contract, WaykiBet works like a betting contract exchange and everyone can build their own bets. More interesting: Effectively avoid the fluctuations brought by floating odds in some less popular games. More intense: Betting builders compete via odds ranking, and users can freely choose odds. More fairness: Winning of a bet will automatically trigger the blockchain smart contract to deliver the payout, without manual participation in the whole process. More transparent: All betting transactions are recorded on blockchain and can be traced by everyone, which is totally open and transparent. The new WaykiChain wallet, named as WaykiTimes, will retain the original wallet functions, such as Lock Revenue Sharing and node voting. In addition, WaykiTimes is mainly designed for WaykiChain and cryptocurrency investors, developers and business partners. In addition to its wallet function, WaykiTimes has also added news and community modules. WaykiTimes is the one and only official platform for you to get thorough information of WaykiChain project. In WaykiTimes, you can easily get to know the latest WaykiChain updates, freely post and comment in community, and discuss hot topics with other crypto enthusiasts. At the same time, WaykiTimes also has WICC transfer and lock functions. WaykiChain official block explorer is a data display system for WaykiChian applications, which displays the WICC transfer and transaction records, account balances, prediction games transactions, and payout results according to application data on the blockchain. All data is open and transparent and inherently irreversible. 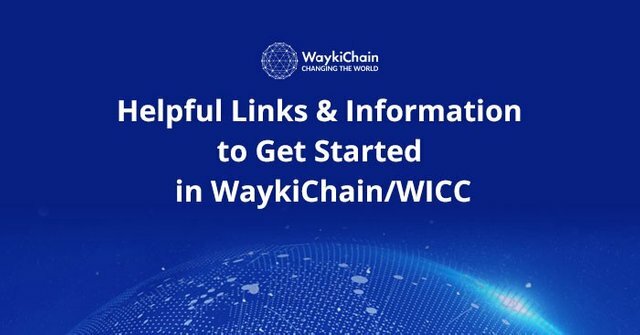 WICC is the token launched by WaykiChain. In order to buy WaykiChain (WICC), we recommend you to buy some BTC or ETH (the highest volume trading pairs) from an exchange that accepts them. Then, you will have to find a marketplace that sells WICC in exchange for the aforementioned cryptocurrencies. We recommend you to buy WICC at AEX or Huobi Exchange (AEX and Huobi has already supported WICC mainnet migration). For more information on this matter, you can visit CoinMarketCap.When it comes to storing your WICC coins, it’s recommended that you use the wallet function on WaykiTimes V2.0 or WaykiBetV2.5. By consuming the tokens, you can also use various applications on WaykiChain. WICC is a token used and circulated in WaykiChain Wallet on our DApps. WICC itself does not have any FIAT characteristics. By consuming WICC as a kind of fuel, users can use applications on WaykiChain; by locking their WICC for a certain period of time, users can share the revenue from WICC lock plan; and by voting for effective and stable accounting nodes, users can earn related interest. WICC can be obtained by participating in the lock plan, by accounting, voting, and subscription, or by trading with other holders. WICC has been listed on over 100 exchanges and trading with other cryptocurrencies for almost 1 year, thus WICC also has trade value. The first one would be the low entry barrier to our eco-system. For developers or Dapp operators they do not need to develop from the chain directly, instead, they only need to develop from the template we published. Even if you are not able to find a team of developers who understand blockchain, you can still deploy the Dapp and run it to make profit. And Waykichain will benefit from all transactions happened since you made this chain active. The second advantage is the product it-self. WaykiBet2.5 is user-friendly to those who do not understand crypto-currency or blockchain technology. In WaykiBet, we initiate a stablecoin using the mechanism like BitShare. The Dapp runners or some acceptance dealer need to pledge some WICC to the smart contract and get stablecoin. By doing this, users can directly buy the stable coin in the Dapp with fiat money, instead of going to the crypto exchange. Moreover, WaykiChain designed a mix of centralized and de-centralized technical structure. By doing this, users don’t need to pay for the gas but the smart contract owner. Moreover, the performance of the entire system can be improved without losing the public creditability. The whole process, being centralized and recorded, can be verified and tracked. Theoretically, this mixed-structure can afford more parrelled transactions at the same time than all other decentralized system. It would be great to create a post for everyone by posting what they want to have for future releases of the Waykichain DApp or anything related to using Waykichain. Therefore, please comment under this thread about your interested contents or create a post directly to express your perspective on WaykiChain. Welcome feedback from the community, so please do get in touch. Want to dive in further? Follow WaykiChain on Telegram, Twitter, Reddit andLinkedIn.